During a talk as part of the New Yorker Festival on Friday, Oct. 10, Bill Hader, unsurprisingly, talked at length about his time at Saturday Night Live. After all, not only was he a cast member on the show for eight years, but he was going to return to host the show the following night. In fact, he left rehearsals to participate in the event. As he explained, "We're literally in the middle of rehearsals" and added that he had to ask Taran Killam to fill in for him in the sketch they were working on. While his words about the show were interesting (and made it sound like extremely hard work), another notable part of Bill Hader's conversation with The New Yorkers ' Lizzie Widdicombe was when he talked about getting to where he is today. Personally, I love hearing people's backstories especially when they have impressive (and envy-inducing) jobs like being a part of SNL, but Hader's story is inspirational for anyone — especially if you have aspirations in comedy, but also if you're just trying to figure out what career is best for you. 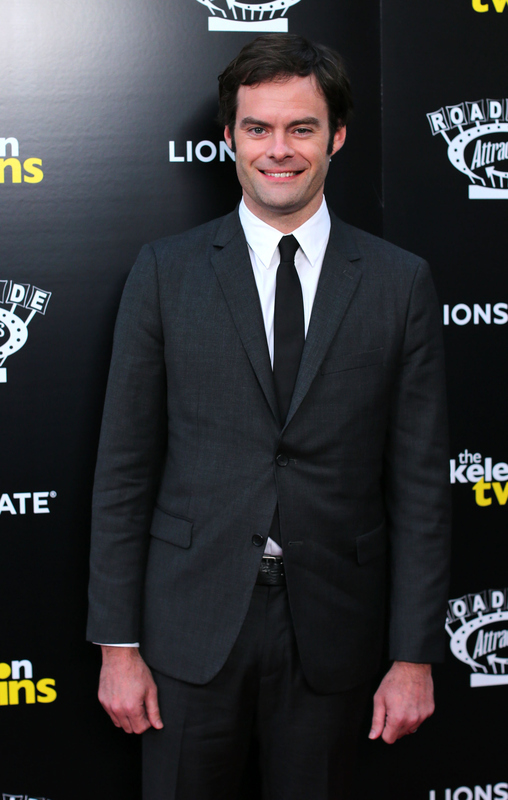 When Hader was hired at Saturday Night Live, he was an assistant editor for Iron Chef America and was doing improv shows in backyards in LA (Hader is originally from Tulsa, Okla.). The actor's big break came when he was doing one of these backyard comedy shows and it was attended by Megan Mullally, who is married to Nick Offerman, who is the brother of Matt Offerman who was in the comedy group Animals from the Future with Hader. Crazy connection, right? Mullally told Hader that she wanted to talk to Lorne Michaels about him, and the next thing Hader knew he was on his way to New York for an audition. Surprisingly, considering he would become known for his impersonations on SNL, Hader didn't have any impressions ready when he found out he'd be auditioning. To combat this, he took a character he'd created, Vinny Vedecci — who would later become a recurring character on the show — and had Vinny do his impressions for him. For instance, "this is Vinny Vedecci doing..." and inserted a celebrity in the blank. Of course, we all know how things went after he auditioned, but before that point, Hader wanted to be a filmmaker which was why he went to LA in the first place. He's still interested in getting into directing, but what Hader really pushed during his talk was that you have to follow what comes to you, go with the flow, and work hard at what you excel at. When he started getting involved in improv, someone told him he was good at it and he explained that this was the first time someone really told him he was good at anything, so it lead him to work hard in that direction. One of the most inspiring things to hear from Hader, is that he still has these other interests. To me, I hear that someone is on Saturday Night Live and that's like the pinnacle of a career. Holy crap. You're on SNL! Nothing needs to come after. What could?! But life doesn't work like that. People naturally have multiple things they want to do. For Hader, this means filmmaking and trying out dramatic roles, for example his role in The Skeleton Twins alongside fellow SNL alum Kristen Wiig. He looks up to the careers of Jeff Bridges who can pull of both drama and comedy perfectly. During a Q&A segment at the end of Hader's conversation with Widdicombe, a 17-year-old girl who is interested in becoming a television writer asked the comedian for his advice, and he echoed his earlier point about working hard in the direction you want to go. He pointed out that everyone he knows who is successful in entertainment, including his SNL costars, has this key part of their being that makes them be extremely determined, hard workers. He also mentioned that Steve Martin's book Born Standing Up is a great guide to working in comedy. Whether you're a teenager who wants to work in entertainment, or an adult looking at a career change to another one of your interests, Hader's story is still moving. Just maybe don't expect Megan Mullally to turn up in your backyard and give you the opportunity of a lifetime.